1 x Set of Brackets and fittings. 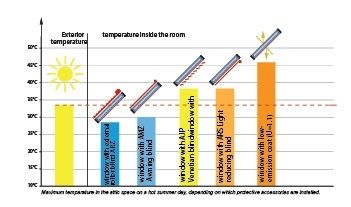 The investigation results above show clearly that external accessories (awning blind and roller blind) provide the best protection from outside heat. The external accessories keep the sun’s rays outside the pane, reduce the heat flow and help prevent the room from overheating.Internal accessories also offer protection from the heat but to a lesser degree than external accessories; their main function is to decorate the space and regulate the amount of light entering the room. Considering the effect of sun protection, the price and facility of installation, the optimum protection from the sun is provided by the external awning blind. The external awning blind together with an internal accessory installed on a FAKRO roof window creates a set of accessories which ensures the highest levels of comfort in the loft space, because they protect from heat and light and decorate the room.